We love incorporating rustic and natural elements into our decor. We often pick up beautiful branches on forest walks. These generally end up decorating our garden, but then we got to thinking, what about tree branch decor for the home? It turns out there are lots of amazing ways to transform branches into tree branch decor. Here are some of the most gorgeous and original ideas. Make a beautiful hanging vase out of a branch, glass jars and twine. This upcycle is made from beach driftwood. It’s so simple and yet so effective as a jewelry display. To recreate it, find some driftwood or tree branches that you like, and add nails to hang your jewelry from. Add string or leather for hanging and display your gorgeous tree branch decor! Here’s a lovely idea to make tree branch decor functional in the kitchen. Use a tree branch to hang all your kitchen necessities. This DIY branch coat rack adds a really exquisite natural element. We love this clever repurposing idea for tree branch decor! Hang jackets and blankets on this gorgeous display piece. This branch book shelf is an awesome way to incorporate tree branch decor. Secure branches to the wall with nails and float a few books on top for a functional display. We love the look of branches in vases. So simple and so stunning! 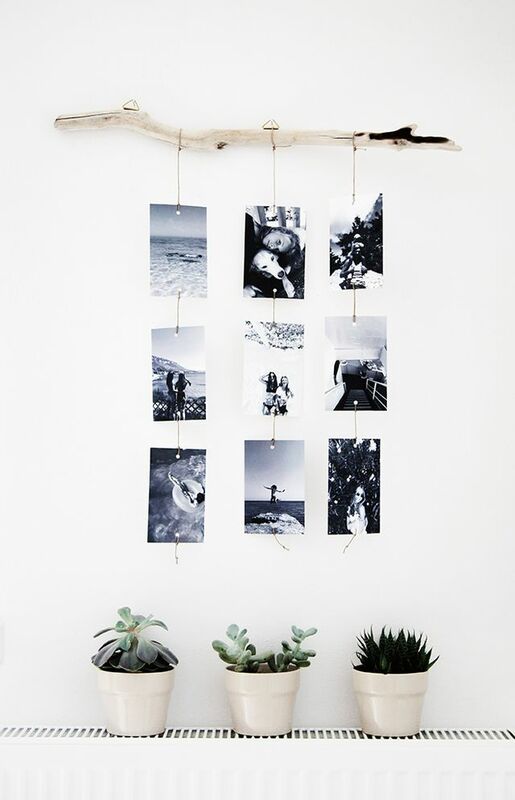 This awesome photo display is so easy to make! Just punch holes in some photos that you like and string them around a branch. Makes for lovely tree branch decor. Smaller branches work really well as key ring holders. This is the perfect upcycle for a front entrance or hallway. Super helpful for keeping track of your keys! Industrial designer Jay Watson created these gorgeous pendant lights out of tree branches. The red cord gives a polished look to these otherwise untouched tree branches. This DIY branch blanket ladder is absolutely gorgeous! It was made from branches from an apricot tree. Such a pretty way to display and store blankets. This gorgeous wall hanging is a total inspiration! It really raises the bar on what can be made from tree branches. These branch candles are amazing tree branch decor! Cut some branches and make a recessed hole for the tea light. Pop the branch candle into a glass votive for a polished look. This branch lamp is incredible! It was made with a pendant lamp and various tree branches. The finished look is so stunning! Which of these tree branch decor ideas is your favourite? so nice, I love it , thanks for this !